For the building, see Court of Final Appeal Building. The Hong Kong Court of Final Appeal (HKCFA or CFA; Chinese: 香港終審法院) is the final appellate court of Hong Kong. It was established on 1 July 1997, when Chinese sovereignty over Hong Kong began, replacing the Judicial Committee of the Privy Council as the highest judicial institution under Hong Kong law. With its constitutional role defined in the Basic Law of Hong Kong, the Court of Final Appeal exercises its judicial powers independent of interference. The Hong Kong Court of Final Appeal Ordinance and the Hong Kong Court of Final Appeal Rules set out the functions and procedures of the court. The Court of Final Appeal has no original jurisdiction. An appeal can either originate from the Court of Appeal or the Court of First Instance. All appeal cases are heard by a bench of five judges consisting of the Chief Justice, three permanent judges and a non-permanent judge. If the Chief Justice does not sit in an appeal, the three permanent judges will sit with a Hong Kong non-permanent judge and an overseas non-permanent judge. Before 1 July 1997, Hong Kong was a British Dependent Territory, and the power of final adjudication on the laws of Hong Kong was vested in the Judicial Committee of the Privy Council in London. The sovereignty of Hong Kong was transferred from the United Kingdom to the People's Republic of China on 1 July 1997. Based on the one country, two systems principle, Hong Kong retains its highly autonomous power and maintains its own legal system. 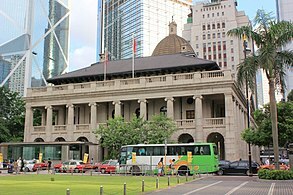 The Court of Final Appeal was thereby established in Central, Hong Kong. Since then, it serves as the court of last resort, thus executing the power of final adjudication on the laws of Hong Kong. Under the Basic Law, the constitutional document of Hong Kong, the special administrative region remains a common law jurisdiction. Judges from other common law jurisdictions can be recruited and serve in the judiciary as non-permanent judges according to Article 92 of the Basic Law. Judges appointed pursuant to Article 92 have served in the judiciaries of England and Wales, Australia, New Zealand, and Canada. The court has the power of final adjudication with respect to the law of Hong Kong as well as the power of final interpretation over local laws including the power to strike down local ordinances on the grounds of inconsistency with the Basic Law. The power of final interpretation of national law including the Basic Law is vested in the Standing Committee of the National People's Congress of China (NPCSC) by virtue of Article 158 of the Basic Law and by the Constitution of the PRC, however national laws which are not explicitly listed in Annex III of the Basic Law are not operative in Hong Kong. Article 158 delegates such power to the courts of Hong Kong for interpretation while handling court cases. Although this arrangement has attracted criticism of "undermining judicial independence", an interpretation by the NPCSC does not affect any court judgments already rendered. Controversy regarding this power of interpretation arose in the right of abode issue in 1999. From its inception until September 2015, the court was located in the Former French Mission Building, in Central. In September 2015 the court relocated to the former (until 2011) Legislative Council Building, which was originally the colonial Supreme Court (1912–1985). ^ "Court Services & Facilities – Court of Final Appeal". Government of Hong Kong. 9 January 2015. Retrieved 20 June 2015. ^ "Finance Committee – Public Works Subcommittee (Papers) 8 Nov 95". Government of Hong Kong. Retrieved 20 June 2015. ^ "Hong Kong Court of Final Appeal – Former Judges – Mr Arthur Michael McMULLIN". Hkcfa.hk. Retrieved 20 June 2015. ^ "Hong Kong Court of Final Appeal – Former Judges – Mr Neil MacDougall". Hkcfa.hk. Retrieved 20 June 2015. ^ "Hong Kong Court of Final Appeal – Former Judges – Sir Derek Cons". Hkcfa.hk. Retrieved 20 June 2015. ^ "Hong Kong Court of Final Appeal – Former Judges – Mr Philip Gerard Clough (Deceased)". Hkcfa.hk. Retrieved 20 June 2015. ^ "Hong Kong Court of Final Appeal – Former Judges – Mr William James SILKE (Deceased)". Hkcfa.hk. Retrieved 20 June 2015. ^ "Hong Kong Court of Final Appeal – Former Judges – Mr Kutlu Tekin FUAD, CBE (Deceased)". Hkcfa.hk. Retrieved 20 June 2015.